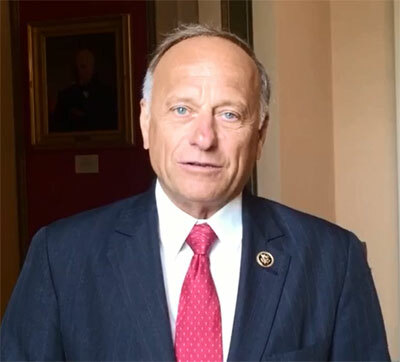 Republican Congressman Steve King says he’ll review all the details, but he’s more than skeptical of the nuclear deal Iran, the U.S. and five other countries have just struck. King watched on TV early Tuesday as President Obama spoke about the deal. If the deal is ratified by the U.S. congress and Iran’s supreme leader gives it his blessing, King doubts inspectors who are to be policing Iran’s nuclear capabilities will be able to go wherever they wish in Iran — and King doubts economic sanctions would be restored if Iran fails to grant those inspection requests. “What really happens is this: $100 billion in sanctions and assets will be released of the Iranians,” King said. And King believes the oil embargo will be undone for good if this deal goes through, regardless of Iran’s quest for a nuclear weapon or financing of terrorism around the globe. President Obama said “every pathway to a nuclear weapon” in Iran would be “cut off” by the deal and Obama argues no deal “means a greater chance of war” in the Middle East. Congress now has 60 days to review the deal and take an up or down vote on it. Negotiators from the United States, Britain, China, Germany, France and Russia spent 20 months negotiating with Iranian diplomats before the deal was announced early Tuesday. Read more reaction from others in Iowa’s congressional delegation, as well as the GOP presidential candidates who were in Iowa when the deal was announced.